A development proposal has just been presented to West Norriton Township, Pa., my home of long residence, that allows me to revisit the subject of a previous post. The fact that this new tidbit provides additional evidence that I was right the first time probably influenced my decision. Picture if you will a road, a rather new and modern super highway, lanes separated by a median, accessible only by grade-separated cloverleafs, pretty much the whole nine yards. It is very heavily traveled, in both directions. At each end is a housing development. They are by no means mirror images of one another, but both were built to take advantage of the new highway and the traffic it would bring. That traffic has materialized, and more than had been planned for (surprise! surprise!). The development at the road’s eastern end not only prospers, it has recently offered plans for a dramatic increase in units. The one at the western end? Opinions differ, but only in varying degrees of disappointment. Why should this be? For starters, because one development is adjacent to King of Prussia while the other is in Pottstown. The fate of these two projects, one at each end of a new road, is testimony to how the construction of a road can be sold to the general public as one thing, when it is actually something quite different. 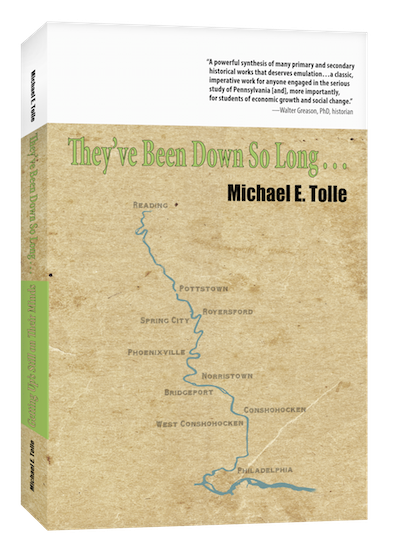 The road about which I write is U.S. Route 422, and I have written about it before, in my post on February 20, 2014 (Why Did They Build The “Pottstown Expressway”?). That post contains what you should know about the project, but here is a brief summary: The road was sold to the public (who would pay for it) as a benefit to a needy community at one end. Its true purpose, however, was to open for development the land along the road itself, to the benefit of a very different group of people. The success of the road’s real purpose is beyond obvious, whether you live in the area or just have to drive through it. This post is essentially just piling on, but the contrast between the two ends of the road has many facets, none of them good for Pottstown. That deserves to be better known. The two housing developments in question were built to take advantage of the same two things: a scenic river along which people would want to live, and a new, modern road to connect the new residents to their workplaces some distance away. That very same combination—with a much stronger road component—is what drives the current building frenzy in the Conshohocken area, but it attracts the roving eye of entrepreneurs wherever it occurs. It did so at each end of the "Pottstown Expressway," and two entrepreneurs chose to build housing developments at those points. Pottstown Borough Council approved the Hanover Square Townhomes project in 2005. The site had earlier hosted Mrs. Smith’s Pies, and great hopes were entertained for this repurposing of abandoned land. Ownership changes and the economy postponed groundbreaking until 2009, after which the construction site was sold again, this time to Cornell Homes Inc. It initially offered townhouses for sale, but the lack of response led to offering some for rent. This has had decidedly mixed results. The eastern site is also an old industrial one, repurposed. The area is known as Betzwood, after an early industrialist, and has hosted several occupants, but its brief early 20th-century turn as a movie studio for Lubin Films is its chief claim to fame. It sits at the foot of the high bridge over the Schuylkill at that point, not quite at the end of Rt. 422, which is just a short distance away after crossing the river. Brian O’Neill, who specializes in converting former “brownfield” industrial sites (and is a major player downriver in Conshohocken), won approval for what became “The Lofts at Valley Forge.” Additional units were later built on the same site, just downriver from The Lofts, and named Riverview Landing. Its website inexplicably identifies Eagleville its location, but it is really in West Norriton. While Hanover Square emphasizes affordability, The Lofts and Riverview Landing aim rather more upscale. The Lofts pitches itself as “luxury waterfront homes for the Philadelphia and King of Prussia area.” True, it is a considerably more picturesque location than that of Hanover Square, although marred by the huge bridge virtually overhead. The bridge, of course, is what quickly connects their residents to King of Prussia, so its looming presence be damned. Without it, there would be no Lofts at Valley Forge or Riverview Landing in the first place. Want more evidence of success at this end of the road? The Lofts and Riverview Landing are about to be joined by an additional 1,330 more apartments in four large buildings, somehow squeezed into the same site. West Norriton has received the Conditional Use Request, and unless the township commissioners somehow grow a backbone and insist on more than one entrance for all these people and their cars, we can expect construction to start in due course. So, it’s location, location and location, right? King of Prussia is happening (and for those who crave something different, Phoenixville is nearby), and Pottstown isn’t, despite the “lifeline” road having been in place for some years now. 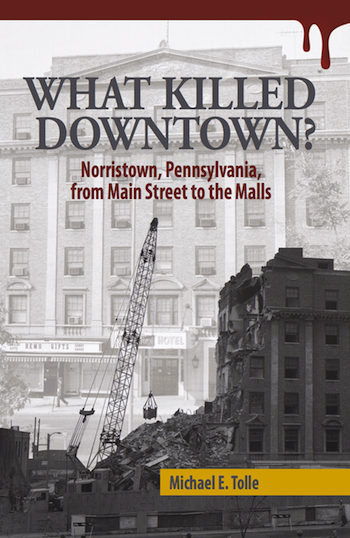 No one calls it the “Pottstown Expressway” any more; that was just a campaign slogan. It’s just Route 422 now. 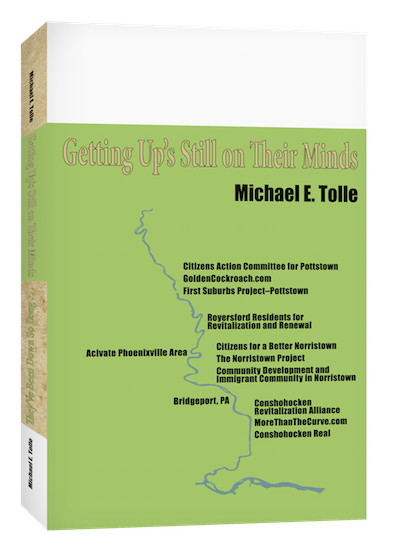 You can read a great deal about Route 422, its traffic nightmares and proposed solutions, but you won’t read anything about how it has energized Pottstown, because it hasn’t. Then again, that wasn’t its real purpose in the first place, remember? That was just the “party line,” and if you control the terms of the discourse, you determine the result. Is it any wonder I use the school cartoon I do to accompany my links on Facebook? In the interest of full disclosure, I must confirm that I, upon discovering that the original plans for The Lofts called for the destruction of the only two remaining buildings from the Lubin area, contacted the late Dr. Joseph Eckhardt, the leading authority on the Lubin studios. Together we successfully lobbied for their retention. I must also note that as this is written, a request has been made to West Norriton Township to allow the conversion of these two buildings into residences, in addition to all the others.